Toddlers can keep us so busy that we might think they will always be physically fit. But toddlers who get used to an inactive lifestyle are at risk for obesity later in life. The U.S. Surgeon General says that daily exercise is a key to being fit. 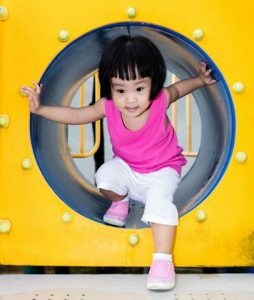 What physical activities can you expect toddlers (ages 1½ to 3) to do? By 18 months, most children can walk well (even backwards), go downstairs backwards on hands and knees, and roll objects on the floor. By age 2, most children can run, push a chair in position to obtain out-of-reach objects, and turn handles to open and close doors. By age 3, most children can jump, throw overhand, and go up and down stairs by alternating their feet. 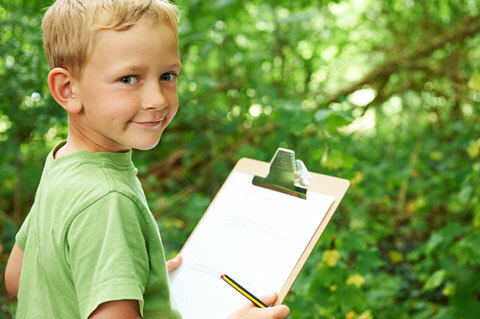 What can you do at home or in child care to help a toddler be physically fit? Offer play equipment and toys that help toddlers get moving. Provide large blocks, construction toys, riding toys, balls and beanbags, and climbers. Schedule at least 60 minutes daily for active free play. Toddlers need more than an hour of unstructured physical play in a safe place every day. Let them set their own pace! They can walk, run, roll, climb, slide, pull, push, throw, and jump until they’re tired. Turn off the TVs, DVDs, and computers. Toddlers should not sit in one place or lie down for more than an hour at a time except when sleeping. Lead them in creative movement. Toddlers practice skills and learn new ways to move by pretending to be animals, workers, or machines. Make an obstacle course. Indoors or out, toddlers can take turns going over, under, around, and between furniture, boxes, and climbing equipment. Exercise together. Make it a part of your routine. Do stretches before lunch. Play in the park or take a walk before the sun goes down (but not too close to bedtime!). Set a good example. Let toddlers see you walk, run, bike, build, dance, climb, or play ball. Keep safety in mind. Help toddlers put on hats and mittens for outdoor play in cold weather. In hot weather, see that they drink enough water and avoid too much sun exposure. If a child has a medical condition that limits active play, a health care provider can suggest ways to help the child be active and safe. Check with a health care provider if you have questions or concerns about the physical activities that toddlers can do. Share books about people being active. Stories about activities such as sledding, canoeing, dancing, building, gardening, or playing sports show toddlers the benefits of being fit. 07/2010 Comments Off on Is My Child OK?